Home > Causes > What is a Subarachnoid Haemorrhage? A subarachnoid haemorrhage is the result of bleeding from blood vessels that cover the surface of the brain. The arteries that supply brain tissue pass through a membrane, the arachnoid, which lies just beneath the skull. The sudden release of blood causes damage to the surface of the brain and the blood does not get to the tissue that it was originally going to. This can prevent oxygen getting to parts of the brain that then suffer to the extent that the cells can begin to die. This leads to further brain damage. 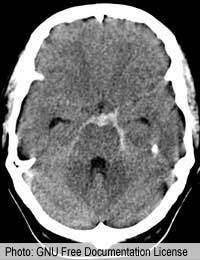 A subarachnoid haemorrhage is a medical emergency. There is nothing that an on-looker can do to help the bleeding but the patient can have a better chance of survival and recovery if they can be admitted to a specialist neurosurgical centre as quickly as possible. Intensive care, including life support and surgery is available here and can be life saving for the 8000 people in the UK who experience a subarachnoid haemorrhage every year. Headache is one of the main symptoms of subarachnoid haemorrhage. People who have recovered described the pain as like nothing they have ever felt before, a bit like being hit on the head with a hammer. Four in 10 people suffer a loss of consciousness and nausea and vomiting are also common symptoms. The combination of severe headache, being confused or slipping into a coma, nausea and vomiting are also symptoms of meningitis. Both conditions need emergency medical treatment but trained health professions will quickly distinguish them. Subarachnoid haemorrhage does not produce fever or a rash and there are no signs of infection on lumbar puncture. Blood does not normally escape from arteries as they have thick and very tough walls. In some people, however, there are weaknesses in the arterial walls that bulge out under the pressure of the blood. These bulges are known medically as aneurysms. About one in a hundred people develop small aneurysms in the arteries that lead into the brain. Because these look a bit like blackberries, they are called berry aneurysms. The wall of the artery weakens with time and there is a high risk that the berry aneurysm will burst, releasing blood into the subarachnoid space. This is the most common cause of subarachnoid haemorrhages, accounting for about 70% of cases. Other rarer causes include malformations in the way that arteries and veins link to each other. Some people are born with arteries and veins that link directly, without going through capillaries. This causes high-pressure blood to enter the much weaker veins, which can split and burst. As bleeding in the brain sets off a chain of events that results in general spasms in unaffected blood vessels, it is important to give emergency treatment to try to prevent this happening. Widespread vascular spasms can cause even more brain damage as they cut off the blood supply to important parts of the brain. People are started on the drug nimodipine as soon as possible when they get to hospital as this prevents the spasms. Normally, it needs to be taken for about three weeks. To prevent the blood vessel bursting or splitting again, which is very likely, people who have had a subarachnoid haemorrhage are booked in for surgery as quickly as possible. The timing depends on the severity of the original bleeding and the condition of the person on admission to hospital. Some people are dangerously ill and are not strong enough to undergo surgery for several weeks. Choosing the right time for surgery is a balance between allowing recovery and not delaying too much in case of more bleeding. Surgery involves two techniques. In the first, neurosurgical clipping, the surgeon cuts a small window in the skull, locates the aneurysm and uses a small metal clip to seal it up. People who have not suffered too much brain damage in the original bleed usually make a good recovery after their operation. The second technique, endovascular coiling, does not involve cutting into the skull. Instead, a tube is put into the main artery in the upper leg and is run all the way through the arterial system to the aneurysm. Small platinum coils are then moved up inside the tube until they reach the aneurysm and they are pushed into it to block the blood vessel up to prevent any further bleeding. Although this procedure sounds very invasive, it is considered much less so than cutting into the skull. It also has even higher success rates than neurosurgical clipping, with much shorter recovery times, and is becoming the treatment of choice.